We may have had crazy wind and no power at Red Barn Studios for rehearsal, but on the next day – Jeff and Cindy’s wedding day – the sun broke out and we had a gorgeous, crisp and partly sunny afternoon. 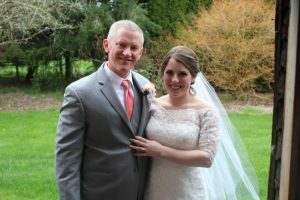 It was happiness for me to travel to Chehalis to marry this beautiful and inspiring couple on the afternoon of April 9th, surrounded by 100+ family and friends. If there was ever a couple meant to be together, it’s these two beautiful people. I was charmed by the time and attention Jeff and Cindy gave to their wedding ceremony and how important it was to involve and/or recognize the people they love most in the world. Before their ring vows, Cindy’s Grandfather, Eldon, shared some personal and important words and I appreciated his touches of laughter. Jeff and Cindy ~ I wish you much happiness, good fortune and fun as you launch on your marriage adventure!